Often, I feel that most of my female clients who are single do not want to be seen or treated differently because being single does not necessary mean that they enjoy an inferior lifestyle. I totally agree with this point of view yet when it comes to planning their finances, I would bring up to them that their financial planning has to be different. To begin with, most single ladies enjoy a higher level of financial freedom (read: shopping, spending and holidays) than someone like me (married with young children) due to lesser commitments. There is also a less urgent need for life insurance as providing for elderly parents is usually the only reason for insuring their life. With the exception of those who are the only child and is expecting to inherit a property from their parents, the main financial goal for most single ladies is to purchase a self-use property which serves as an “anchor” for the future. In short – Independence, Freedom and a Place to stay. I did not start out thinking this way but after some time, the pattern that emerges is quite clear. The financial plan that most female who are single wants (or at least what my female clients wants) is to ensure that they can remain independent, free to make choices without financial constraint and most importantly, have a place that they can call their own. When it comes to financial planning, every woman’s unique personal situation will require the plan to be customised. Some are self-employed while others could be working in industries with a long and stable outlook. Some build their social networks around their faith while others have theirs around a hobby or interest. Some still have parents to provide for, others have younger siblings to worry about and in addition, a rising topic of concern – planning for their pets. Amongst all these differing profiles, there is a basic fact that all women need to be aware of: Women in Singapore are expected to live long (life expectancy is 84.9 years in 2015) but they will also suffer from ill health for a long period (last 9 years of life with ill health). The problem for most women who are single is that there is an expectation that there is no one to share the load with, especially in the later years. This is where there must be a focus on certain financial planning needs for women who are single. Take the example of Miss Chua, a friend and client of mine. She is single, an only child who is expecting to inherit her parent’s property and works in the web design industry which offers her exciting growth opportunities in the short term. Yet, one of her concerns is being burnt out from the constant need to be creative and meet deadlines in her job. As she is in her late-thirties, she is really starting to think longer term and wonder how she can plan financially beyond the setting up of insurance and savings plans. When I first started working with her on financial planning, the first objective is to let her understand the importance of having a financial plan for the long term and what that financial plan should consist of. More importantly, what having a good financial plan will mean to her in the future – the ability to maintain her sense security and freedom. You must not allow yourself be caught in a financial jam due to medical bills. Having hospitalisation insurance will remove this unknown financial risk and free up your savings for other goals (see priority 2). These type of insurance plans are designed specially for women to encourage proactive health management. A key feature is that it usually comes with a complimentary comprehensive medical checkup (once every 2 years) that ‘forces’ you to take care of yourself and get your health checked despite the busyness of life. Early detection of any illness is important and what is even more valuable is having the money to pay for early medical intervention. Women illnesses such as early stage breast cancer are also covered under this type of plans to ensure funding support. Click here to download list of women’s insurance with complimentary health screening. My female clients often feel a sense of “financial vacuum” after they purchased a property, usually around the age of 36 to 40. Before buying the house, there is a goal to save for. After buying the house, the question is “what’s next” and there don’t seem to be anything tangible to aim for. Planning for retirement is usually not appealing because work allows for engagement and networking so there is actually more motivation to keep working than to stop working. However, what often appeals to women who are single is the option to reduce or “dial down” the work load and have free time to do what they want, when they want to do it. In fact, some of my female clients think of their future in blocks of 2 or 3 years. If something appeals, most will work and when their energy are exhausted, most wants to take weeks or even months off before moving on to the next project or opportunity. This is where having a guaranteed income that pays for life is so important. Ideally, the income should be enough to provide financially for all the basic needs so that you can have the freedom to take a break at any time. And if you choose to work, the salary can serve as an extra cash flow for personal well-being and enjoyment. One of the most effective ways to have a guaranteed income for life is through a guaranteed life annuity plan. 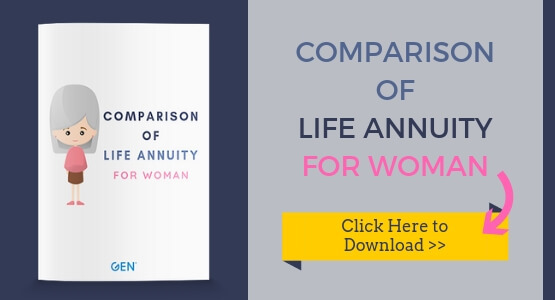 You can use this Comparison of Life Annuity for Woman which I’ve created to help you understand how a life annuity can help you generate a guaranteed income for life. This is the most difficult to discuss and plan because we are talking about a period where we are no longer physically independent. This is especially difficult for a women who is single to think about because all the planning thus far has been about keeping the sense of independence. You are invited to our upcoming Workshop for Women: How Should Your Retirement Planning be Different? 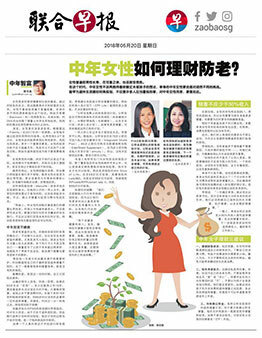 Having a guaranteed monthly income is probably what will provide the most financial comfort but it is often a neglected part of financial planning for women who are single. Perhaps, there is a confidence that they can always work. Or, the feeling that because they are single, expenses are likely to be low so there is no urgency to plan for having income. For some who believes in planning for the future, they have no idea how to kick-start their planning with the goal of having an income for the future. Just like everyone needs to have some form of medical insurance, I believe it is essential to have some form of life annuity and this is especially so for women who are single. If you would like to get started on annuity planning, download this Comparison of Life Annuity for Woman. If you want to know more about Financial Planning for Women be it single or married or any other enquiries, you may contact me through whatsapp, schedule an appointment with me or fill up the form below and I will get back to you as soon as possible.